Overwrite of RRTXstatic setEpsilon. It does nothing but warn the user that this parameter cannot be changed. Use direct sampling of the heuristic for the generation of random samples (e.g., x_rand). If a direct sampling method is not defined for the objective, rejection sampling will be used by default. Get the state direct heuristic sampling. Get the state of the sample rejection option. Set the number of attempts to make while performing rejection or informed sampling. Get the number of attempts to make while performing rejection or informed sampling. Get the threshold epsilon the planner is using. Use a k-nearest search for rewiring instead of a r-disc search. Get the state of using a k-nearest search for rewiring. Set whether or not to always propagate cost updates to children. True if the cost is always propagate to children. Set variant used for rejection sampling. Get variant used for rejection sampling. Set the value alpha used for rejection sampling. Get the value alpha used for rejection sampling. Update (or add) a motion in the queue. Removes the given motion from the parent's child list. Gets the neighbours of a given motion, using either k-nearest of radius as appropriate. Calculate the k_RRG* and r_RRG* terms. Calculate the rrg_r_ and rrg_k_ terms. Test if the vertex should be included according to the variant in use. Option to use k-nearest search for rewiring. A constant for k-nearest rewiring calculations. A constant for r-disc rewiring calculations. A list of states in the tree that satisfy the goal condition. Comparator of motions, used to order the queue. Queue to order the nodes to update. Threshold for the propagation of information. Whether or not to propagate the cost to children if the update is less than epsilon. Current value of the radius used for the neighbors. Current value of the number of neighbors used. Variant used for rejection sampling. Alpha parameter, scaling the rejection sampling tests. Option to use informed sampling. The status of the sample rejection parameter. The number of attempts to make at informed sampling. Optimal Rapidly-exploring Random Trees Maintaining An Optimal Tree. RRT# is an asymptotically-optimal incremental sampling-based motion planning algorithm. It is similar from RRTXstatic but maintains an optimal tree, same as RRTXstatic with a treshold 0. The parameters are the same as RRTXstatic except for the parameter epsilon. 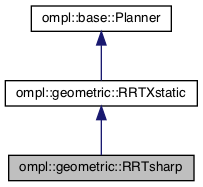 Definition at line 67 of file RRTsharp.h.